urgundy can be considered as four distinct entities. In the north lies Chablis, at its heart is the Côte d’Or (Cote de Nuits and Côte de Beaune), next comes the Côte Chalonnaise then, still further south, the Mâconnais. 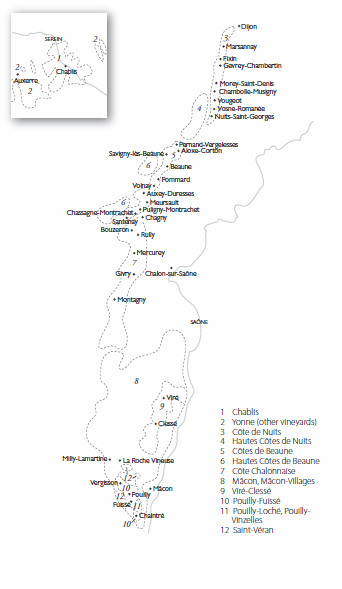 The main appellations for each are given below, with more detail in the individual sections that follow. Chablis and the surrounding Auxerrois are isolated from the heart of Burgundy – Chablis is located about 90 miles south east from Paris, halfway to the Côte d’Or. All Chablis is produced from the Chardonnay grape and is classified by vineyard site as either Petit Chablis, Chablis, Chablis Premier Cru or Chablis Grand Cru. Other than Chablis, there’s distinctive Sauvignon around Saint-Bris and in good years pure cherryish Pinot Noir in Irancy, both villages with their own appellations. Pinot Noir or Chardonnay from other villages in the Yonne is suffixed Bourgogne. The Côte d’Or is synonymous with Burgundy and includes all its great red wines. The two parts are the more northerly Côte de Nuits (mostly reds for cellaring) and extending southwards, the Côte de Beaune (pre-eminent whites and elegant reds). The CÔTE DE NUITS is Burgundy’s most classic red wine district, based primarily on just one grape variety, Pinot Noir. The Côte runs from south of Dijon in Marsannay and Fixin, a source of ever better, gently priced wine. Then it’s onto the big gun downs through the top communes of Gevrey-Chambertin (home of grands crus Chambertin and Clos de Bèze), Morey-Saint-Denis (cradle of grands crus Clos de la Roche, Clos Saint-Denis, Clos des Lambrays and Clos de Tart. In Chambolle Musigny, the wines attain an ethereal character in tune with a fine-boned structure, partly in Bonnes Mares and supremely in Le Musigny). Further southwards to Vougeot and particularly in grand cru Clos de Vougeot, the reds can assume a majestic power. Grands Echezeaux is the Monsieur of Flagey-Echezeaux and then probably the most sought after village – Vosne-Romanée, site of legendary grands crus Richebourg, Romanée -Saint-Vivant, La Romanée, La Grande Rue and the summit In Romanée-Conti and La Tâche. The Côte ends in Nuits St Georges, with no grands crus but some very fine premier crus from great producers. The CÔTE DE BEAUNE is famous for great white Burgundy made from Chardonnay, although more Pinot Noir is planted. Much of both is at least potentially very high quality. In a confusion of appellations in the north, Aloxe-Corton with the famous grands crus of Corton (mostly red) and Corton-Charlemagne (white) stands out. Beaune, Pernand-Vergelesses and Savigny-lès-Beaune produce fine reds but some good whites too, while the celebrated Pommard and Volnay are restricted to red. Monthélie, and Auxey-Duresses provide more affordable red and a little white, while Saint-Romain and the often excellent Saint-Aubin do better with white. The big three white Burgundy appellations are Meursault, Puligny-Montrachet (including grands crus Chevalier-Montrachet, Le Montrachet and part of Bâtard-Montrachet) and Chassagne-Montrachet. The latter also produces red as do Santenay and Maranges in the tail of the Côte d’Or. The CÔTE CHALONNAISE begins close to this tail. Both the wines and the countryside are distinctly different but the village appellations are again classified for wines from Chardonnay and/or Pinot Noir – with the exception the first village, Bouzeron, which is classified for Aligoté. Rully makes more white than red, while Mercurey and Givry produce mostly red of much improved quality from new rootstock planted around 15 years ago. The southernmost appellation, Montagny, is for Chardonnay alone. Crémant de Bourgogne is for the region’s sparkling wine. As in the Côte de Beaune here too there is greatness in white wine (from Chardonnay), with a new wave of excellent producers beginning to emerge. Quality wine production is focused on Pouilly-Fuissé (with its four communes of Chaintré, Fuissé, Solutré and Vergisson), adjoined at its eastern end by the small Pouilly-Loché and Pouilly-Vinzelles ACs. There is a move to classify these premium vineyards, especially Pouilly Fuissé as premiers crus. Many other vineyards north and south of Pouilly-Fuissé qualify as Saint-Véran which in the right hands and sites can equal Pouilly Fuissé. There is fine quality too from Viré-Clessé and increasingly from several of some 43 villages that can be suffixed to Mâcon (eg Mâcon-Bussières).